The first week or so was a bit rough… besides getting used to the mask, I was experiencing terrible dry mouth. The dry mouth issue was due to the fact that we keep it pretty cold in our bedroom (we use a heated blanket) and the nurse I met with told me they would ship me a special heated hose which would help with the dryness. Getting the hose took over a week due to a few mix-ups, but once I got it, things were much better. Let me just say right now… I never knew I could sleep so good. For pretty much my entire adult life, I got terrible sleep. When I was younger, it didn’t bother me that much, but it’s gotten worse and worse in recent years. Besides not getting enough sleep myself, I’ve annoyed the crap out of my wife with my snoring. So while I wasn’t sleeping well, neither was she. In the past year both of us have taken turns on the couch just so we’d both be able to get some sleep. So… the good sleep. Finally, some good, solid sleep. Before the CPAP, I could have “slept” for 8+ hours, and still gotten out of bed completely exhausted, but as it is now, I can sleep 6 hours, and wake up knowing that I can get through the day without falling asleep or even getting drowsy. I’m awake, alert, and more engaged. I even dream now! For years I didn’t dream much, due to the fact that I never got into REM sleep. That’s changed as well, and I’m dreaming quite a bit now. But it’s not all sleepy dreams and happiness. Even though I’m getting good sleep, my wife is still struggling with my amazing new ability to sleep. Here’s where I get into the bad parts of the CPAP. You might thing that the CPAP machine itself is noisy, but it’s really very quiet, so that noise isn’t an issue, but what is an issue is the mask I wear. To put it on requires two snaps. “Click! Click!” goes the mask when I put it on. So if I get in bed later than her, I’m making noise. If I go to the bathroom in the middle of the night, I need to remove the mask, and then put it back on, so I’m making noise. Alternately, I can keep the mask on, but remove the hose, and that goes “Snap!” when it attaches. More noise… But wait! There’s also the Velcro adjustment straps. “Rip! Rip! Rip! Rip!” if I need to adjust for air leaks. As for the machine, well, the power button makes a “Click!” though not as loud as the mask, and the LED display is bright enough to light up the room, so I keep it covered with a piece of fabric. All in all, I’d love to see some improvements in the silencing of the whole process… but ignoring all that, it’s still pretty damn sweet. Wearing the mask can be annoying, but when I think of the alternative, I’d prefer to wear the mask and actually get some sleep. Oh, I also talked to one person who said it freaked them out, and they were worried that the power might go out and they wouldn’t be able to breathe and… It doesn’t work that way. 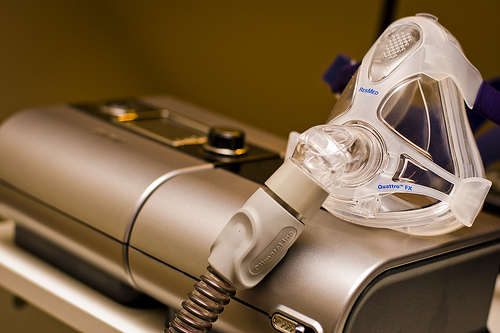 CPAP is “continuous positive airway pressure” not a respirator. You can keep breathing (and stay alive!) even if it shuts off. And yeah, the mask isn’t fun like a Halloween mask, but like I said, it’s worth it for the change its made in my life.